Trade Review – Should He Have Exited? 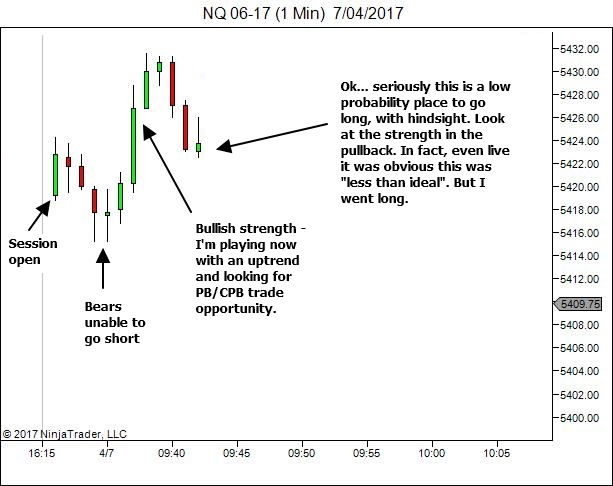 I received a question from a reader who made an exceptional trade but was concerned that he should have exited the trade much earlier, scratching for a small loss and then possibly seeking re-entry. 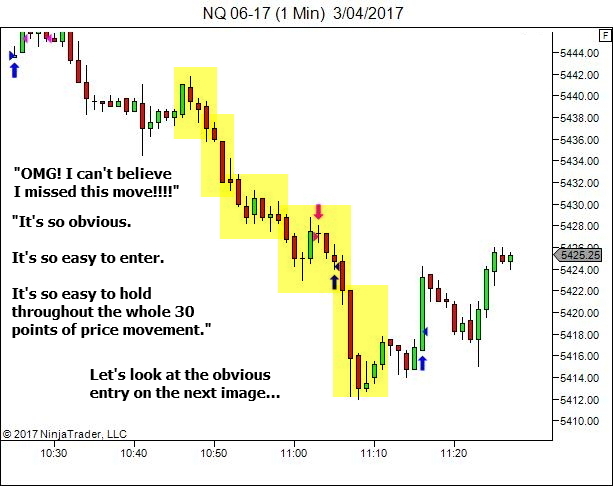 I would typically expect most traders to be ecstatic about a win. But it's a sign of someone much more advanced along the journey, who is more concerned about developing good process than in just celebrating the win. Here is the trade, along with their question. I've had to shrink the image a bit to fit here. I'll discuss the question below so it's not essential to be able to read the text. But if you are interested, click on the image and it will open a full-size copy in your browser. 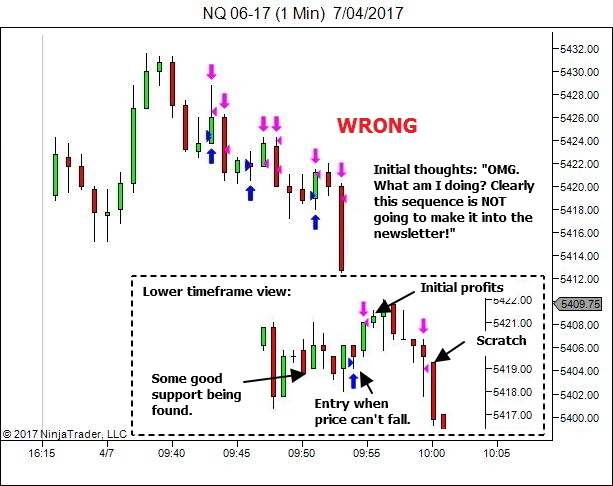 The Trading Timeframe is the 5 minute chart, shown in the small insert to the upper left. The main part of the image shows the 1 minute Lower Timeframe. 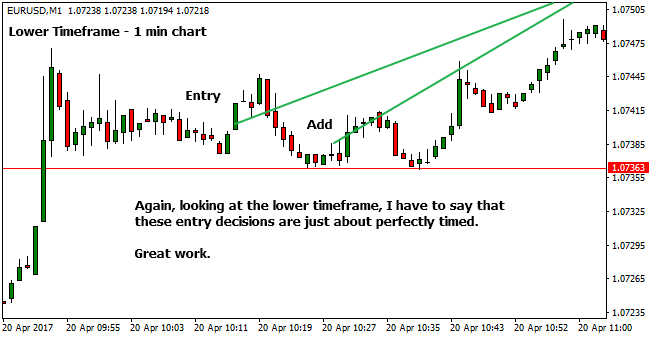 But let's take a look through my charts, starting with the 60 minute timeframe for some wider context and then stepping down through both the 5 and 1 minute charts. I love it. That is a very nice BPB trade. But here's the question, courtesy of the trader who we'll just call M.I. M.I. 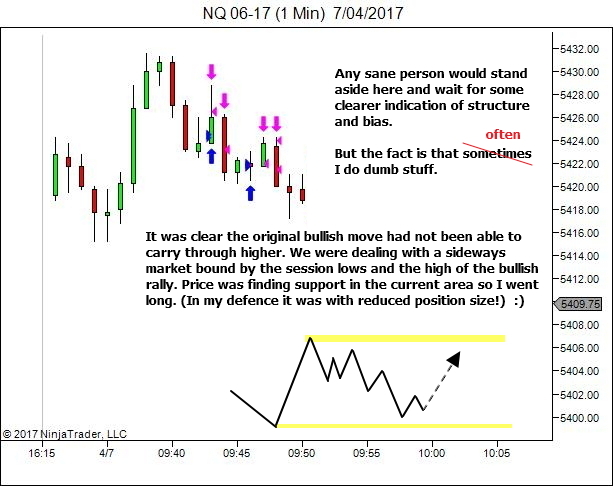 is correct in his understanding of my style of trading. 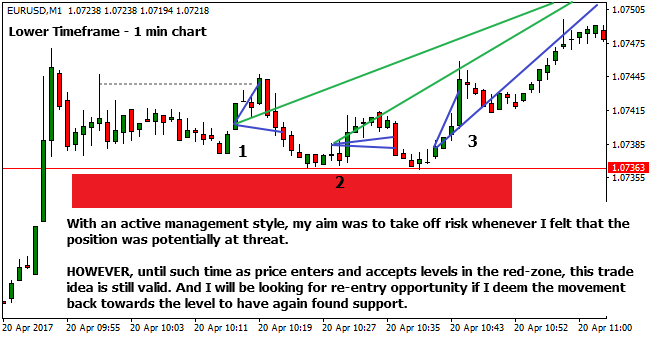 Over the years I've developed a preference for active management of my positions, in particular around the entry point. My preference is to not just hold and HOPE. But rather to be taking off risk if I feel the position is threatened. And re-entering if the trade premise does remain intact. 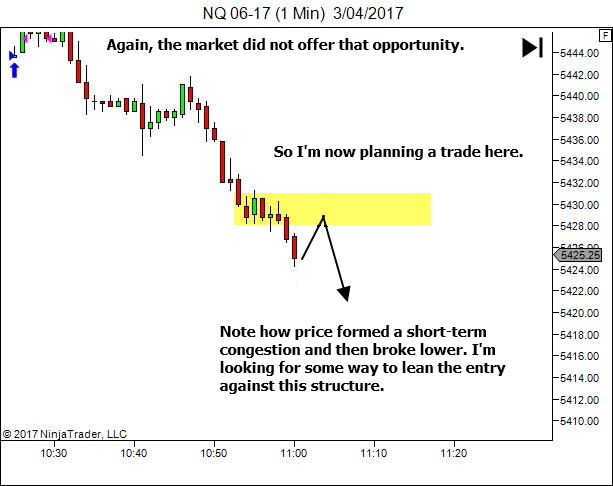 It's always impossible to say exactly how I would have traded something live, when I wasn't actually there to experience the price action. 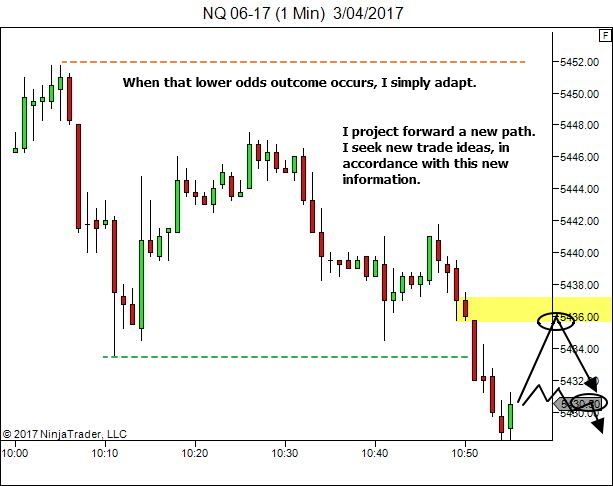 Hindsight knowledge of the outcome DOES alter the way we believe we would have traded. Here is the thing though – IT DOESN'T MATTER. There is no right or wrong method of trade management. Either way is fine – completely passive set and forget, or quite active like I prefer. Or in fact anything in-between. What is important is finding and developing your own style and then using that consistently. Sometimes passive management will have outperformed. Quite likely in this case, M.I. 's management method would have resulted in greater profits than mine. At other times though, active management will be far more profitable (such as here). Find what fits your personality. And just be consistent. We both have the same area at which we deem the trade invalid. Either way is fine. Find what best fits your personality and just be consistent. Active, passive, or any blend in-between. Your style will likely develop over time, regardless of which you start with. Track your results. And work to improve. Even better, if you can afford the time, track both methods and compare the results over time. Most likely though, personality will play a greater part in the ultimate style, rather than which offers the greater profitability. A little tip though, if you're unsure where to start. Look at the worst case for each scenario and see which offers the maximum regret. Then avoid that option. Passive management – the worst case scenario is when the trade does fail and you could clearly see that it had lost it's edge, having tons of time to scratch the trade for a small profit or small loss, but instead hold the trade for a full-size loss just because someone told you "that's how you're meant to do it!". Active management – the worst case scenario is when the trade idea works, but you've scratched the position for a small profit or small loss, and then can't find any way back in, watching the market move to your original targets without you. Visualise placing a trade. And then work through both scenarios. Which feels the worst? Now, avoid that method and start with the other. For me, I'm quite comfortable missing a trade. I'm happy to let it go. It wasn't mine to catch. And I'll just move on to the next. But holding a position for a loss, when I could see it coming well ahead of time. That's just stupid (IMHO). I choose active trade management. But it's not the only way. And it's not necessarily the right option for you. 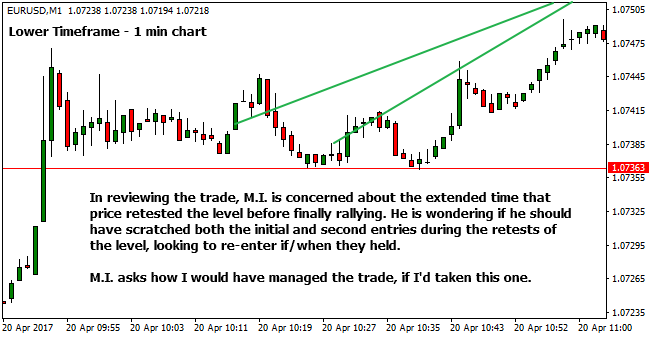 M.I., you chose a passive style of management for this trade. And it was a GREAT TRADE. Perhaps that is the style that suits your personality the most at this stage of your development? If so, don't worry about how I would have traded the position. 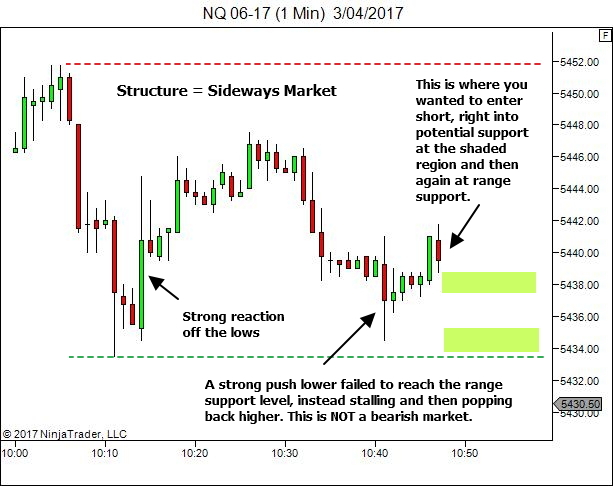 Take notes on your trade. Keep your stats. And continue to monitor and grow over time, allowing your trade management style to naturally evolve over time. This was an interesting sequence of trades – three which I got completely wrong, followed by one which I finally got right. You won’t always get it right. Sometimes your timing is out. Other times, like in this sequence, your assessment of bias is just wrong. 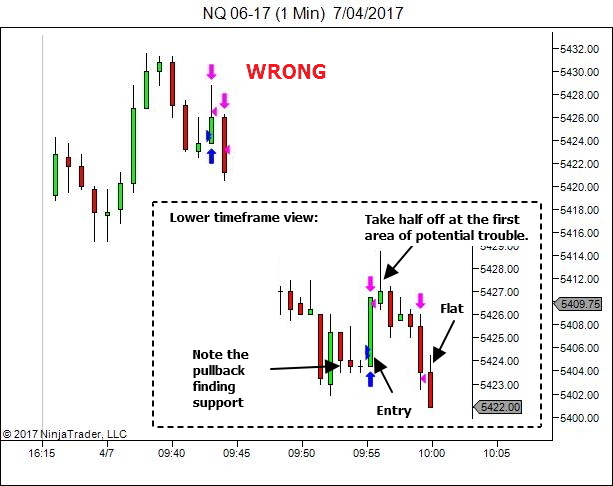 Good entry location and good active trade management can ensure that even when you get it wrong, you still don’t lose much. Or, as in this sequence, you don’t lose anything. One right trade can more than make up for numerous wrong trades. Profits come from a series of trades. Not from individual trades. In this business, individual trade results are irrelevant (assuming they do not break your money and risk management limits). 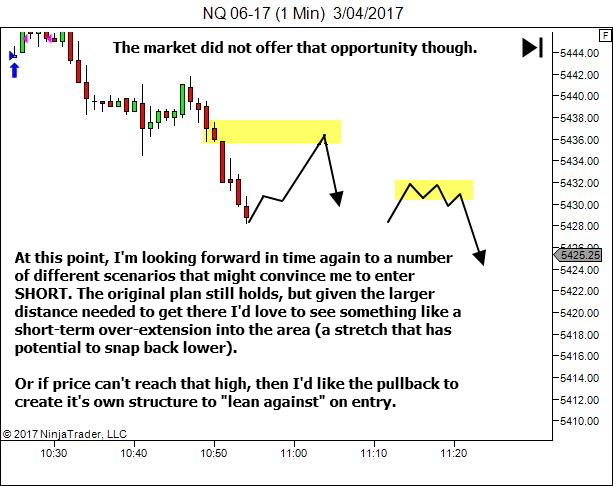 Note importantly on the Trading Timeframe that the entry was very much near the low. There was absolutely NO waiting for confirmation of price moving higher. 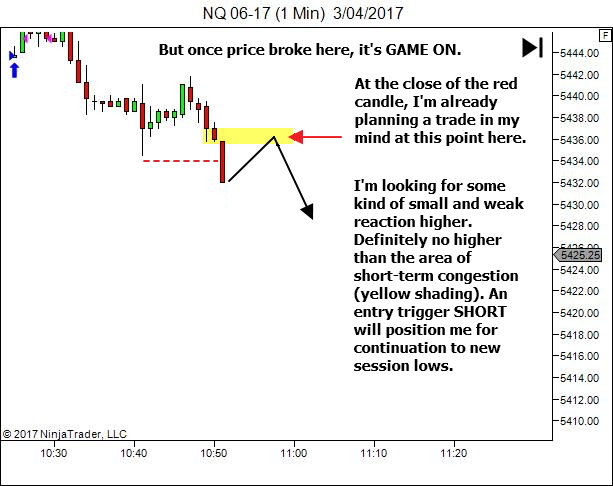 Instead, entry was taken when price showed it could not move lower. Note also how active trade management allowed the trade to profit, with half taken off at the first target area and the remainder scratched for a smaller loss once it was clear this trade was wrong. Good decision making with regards to entry and trade management ensured that I did not lose here, despite being wrong about the direction of the market. 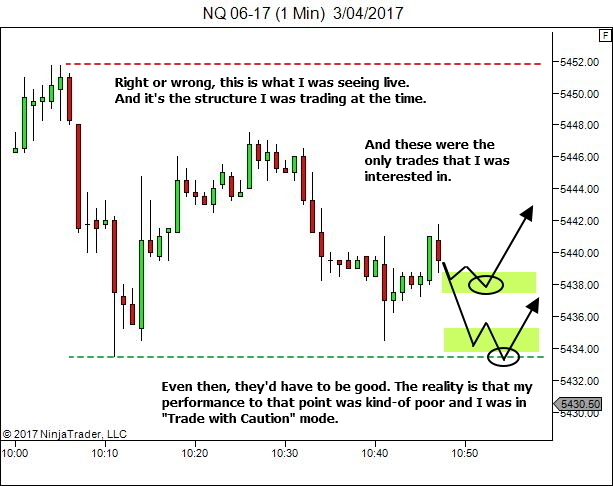 Note also how active trade management allowed the trade to profit, with some risk taken off when I wasn’t happy with the post-entry stall. This turned out premature, but it’s a good decision. Price should have moved quicker. 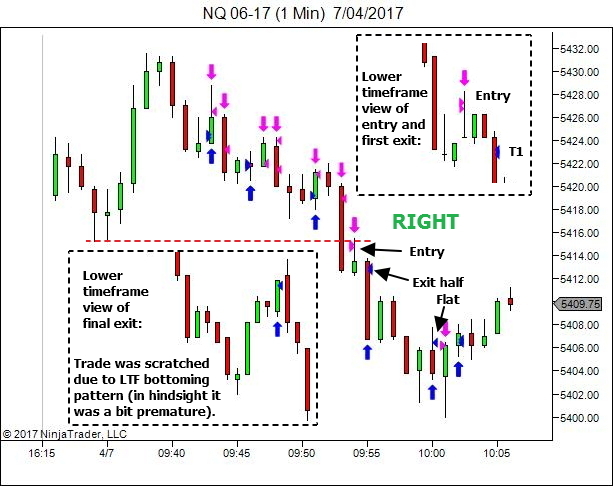 Of the remainder of the position, half is taken off at the next stall area and the remainder scratched for a smaller loss once it was clear this trade was wrong. 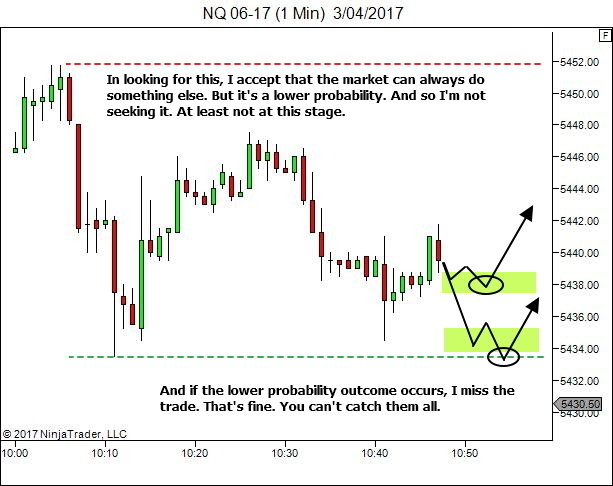 Yes, the temptation to not show bad trading is GREAT. But sometimes there are good lessons. Note also how active trade management allowed the trade to profit, with some risk taken off early (in the area of the prior pullback lows) and the remainder scratched for a smaller loss once it was clear this trade was wrong. 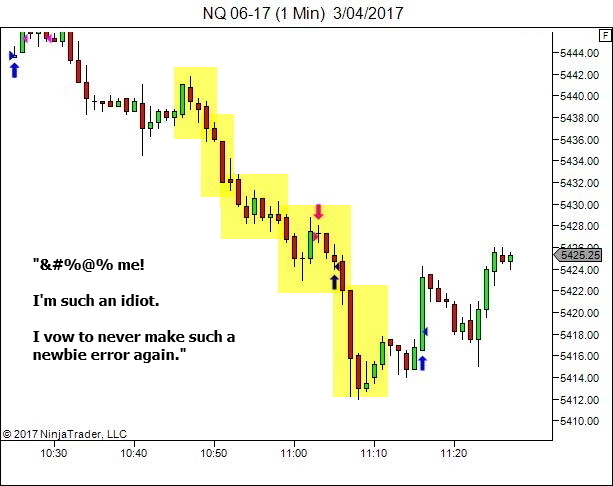 Never judge a missed trade by how it looks AFTER THE SESSION. 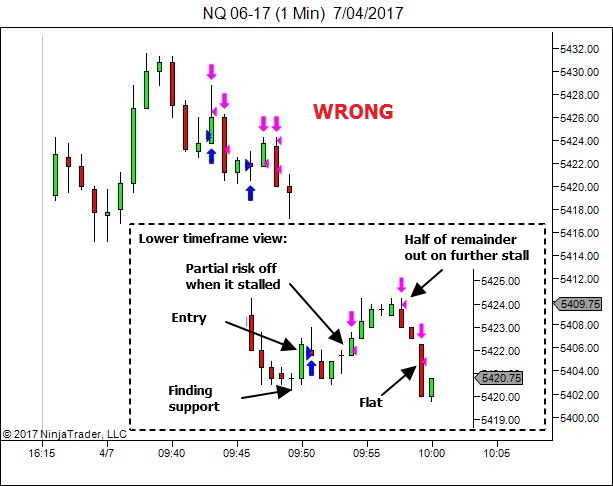 Always judge a missed trade by how it looked AT THE RIGHT-HAND SIDE OF THE SCREEN AT THE TIME OF ENTRY. Thank you Lance, again, for your recent article. One question that has stuck in my mind comes from the second image where you talk about the earlier missed entry. You said you can see it's an obvious trap entry point. But you weren't looking for that. Why not? Why did you miss the trade? Because, I agree with what you said. It looks obvious. 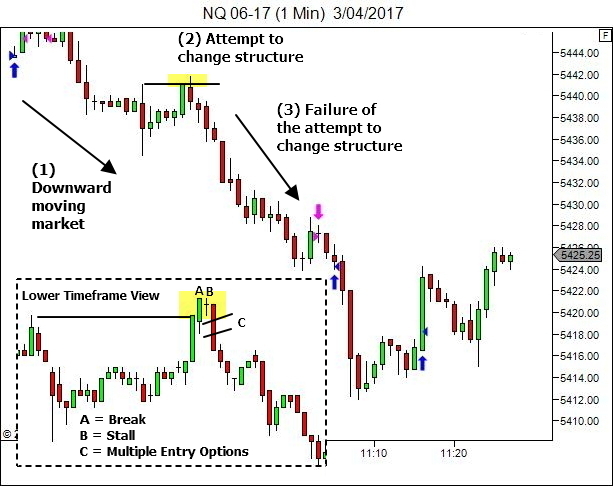 Check the prior article if you missed it – http://yourtradingcoach.com/trading-process-and-strategy/how-do-you-find-time-to-plan-a-trade-on-a-1-minute-timeframe/. Ok, this is a common error. 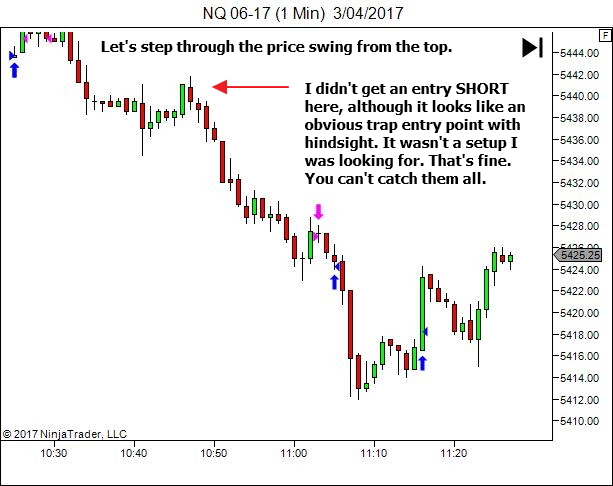 It's so easy to look back at a chart post-session and find the largest and smoothest price swings. And then analyse the entry point to find the obvious way to get into that trade. Followed shortly after by calling ourselves all kinds of names for having missed such a blindingly obvious entry. And then vowing to never make such a newbie error again. Trades look different at the hard right edge of the screen. 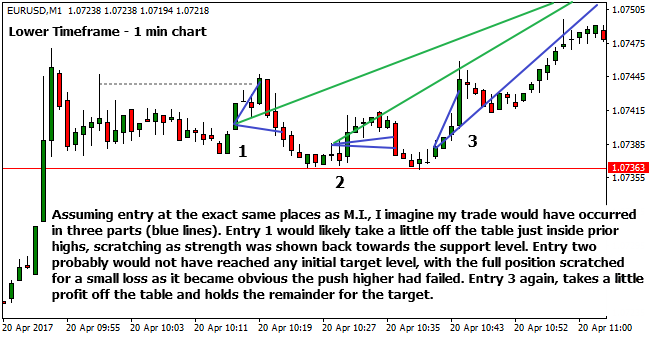 Here is the same missed trade from a different perspective, looking back at some earlier structure and positioning the entry point at the right-hand side. I'm ok with missing this trade. I feel my assessment at the hard right edge was reasonable. I accept that you can't catch them all. And this is simply one that was not mine to catch. Hopefully you were able to catch it and profit from the whole move. YES… we must review our charts post-session. And it's very important to review the strongly directional price swings that were missed. But make sure that the primary part of this review occurs at the hard right-hand edge of the screen. Is it really something you should have caught? 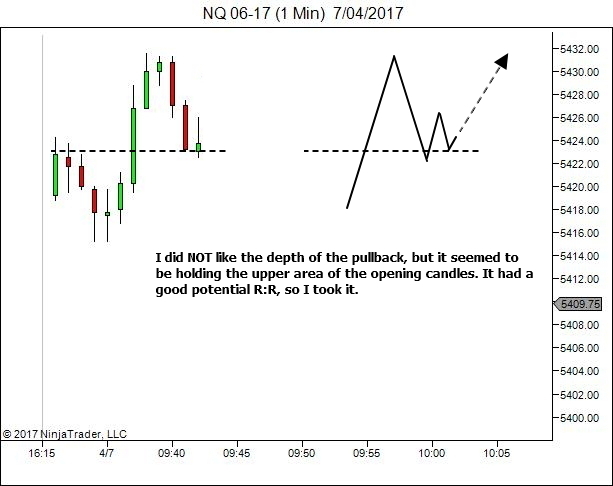 Or are you influenced by the hindsight view of the trade outcome? Because the simple fact is…. You can't catch them all. 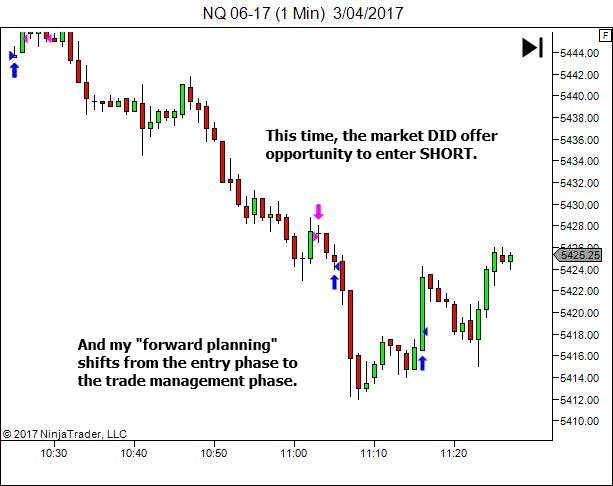 How Do You Find Time to Plan a Trade on a 1-Minute Timeframe? This is a question I get from time to time. Quite a reasonable question, I guess, for anyone used to trading on much longer timeframes. The answer is simple. And if you do it right you'll find that there is plenty of time. Even on a 1-minute chart. 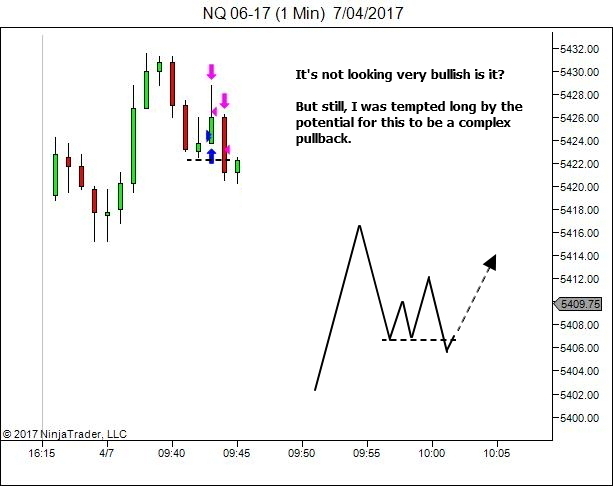 Lower timeframes require that you see the trade setup in your mind, well before it shows up on the chart. 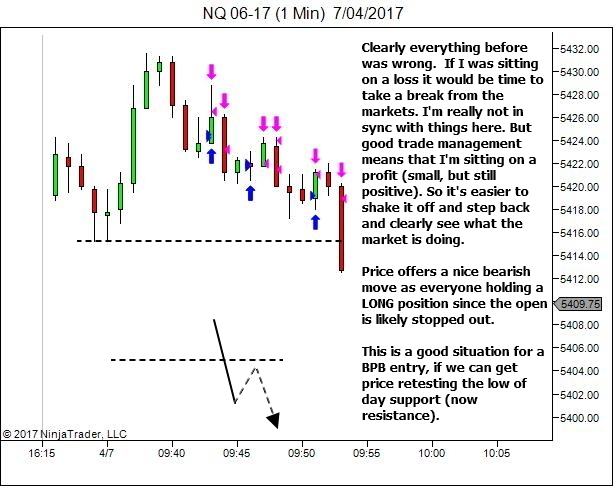 In fact, I'd suggest that this is good practice, regardless of your trading timeframe. It's a matter of visualisation – plotting in your mind the most likely path for the next couple of price swings. And becoming clear in your mind about EXACTLY what you need to see if these price swings could offer a trade. Think of it like a visual form of an IF-THEN statement. "IF price goes here and looks like (this) THEN I will have potential trade opportunity." Focus is always kept AHEAD OF PRICE. 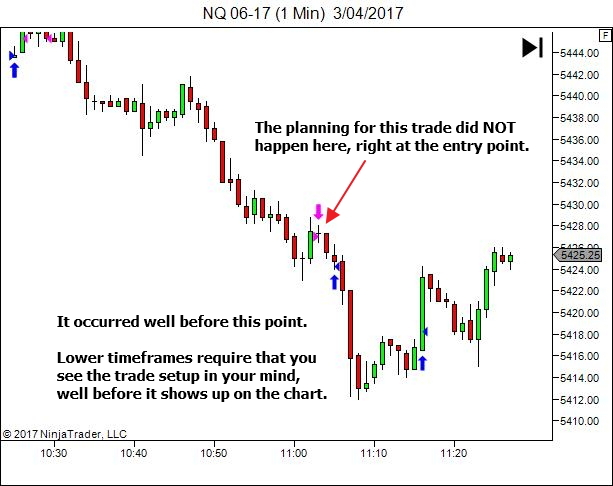 In this case, the trade planning was carried out 2-3 minutes prior to the setup actually occurring. That's quick. 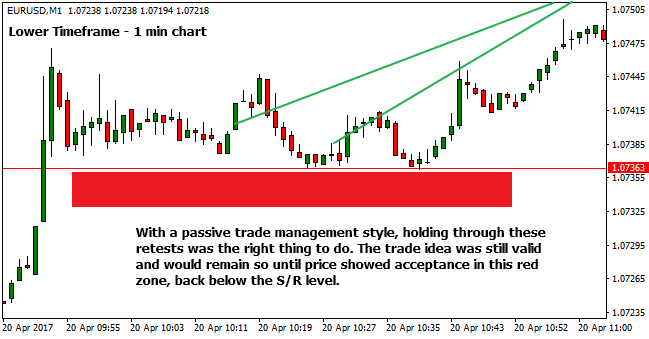 Often a trade idea might be visualised 5 or even 10 minutes before price sets up for entry. Either way, it's plenty of time. Trade entry should not be a 100% reactive process. It should be forward looking. Pre-considered and pre-planned. And only acted upon if price should subsequently prove your forward planning to be correct. The same goes for trade management. Keep your focus and planning ahead of price. Where is price going if the trade premise is still valid? How will this look on the charts? How will you manage your stop and target orders if this happens? And where is price going if the trade premise is no longer valid? How will this look on the charts? How will you react if that happens? Keep your focus and planning ahead of price. If you can do that, then there is PLENTY of time to plan your trades, well before price actually gets to the entry point.